"Because of SoHo's sprawling character, I have yet to work out an effective system of taking it all in," critic David Bourdon wrote in 1977, describing his frustration at visiting all of the neighborhood's galleries. These days Bushwick (or Ridgewood, when that art area crosses over into Queens) feels like the trickiest expanse to navigate, and I have yet to work out an effective system for doing so. All of which is a roundabout way of admitting that, when, a few weeks ago, I visited the much-discussed Regina Rex gallery, which opened there in the middle of last year, it was — embarrassingly — for the first time. 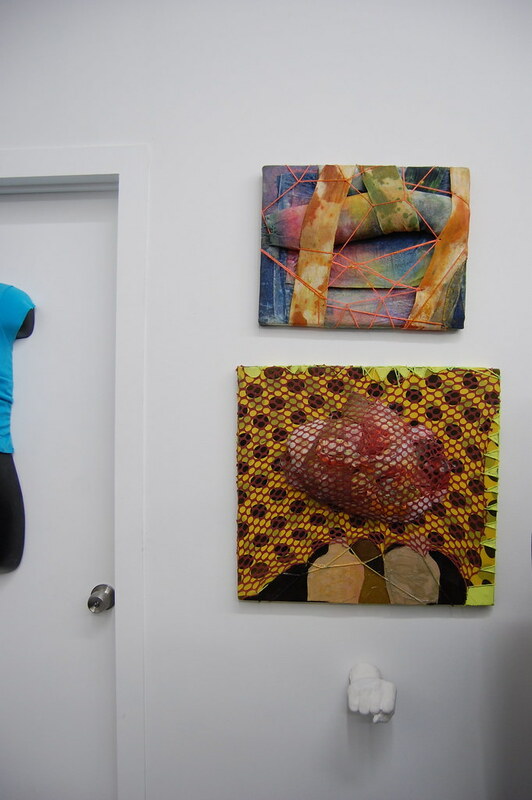 The show on view at Regina Rex now is called "Texture.txt," it is up through February 13 (open Saturdays and Sundays only! ), and it is a stunner, though viewing it took some patience and maneuvering at the wonderfully crowded opening reception. The most thrilling piece, for me, is New York artist Dona Nelson's double-sided painting Spacey Characters (2010). 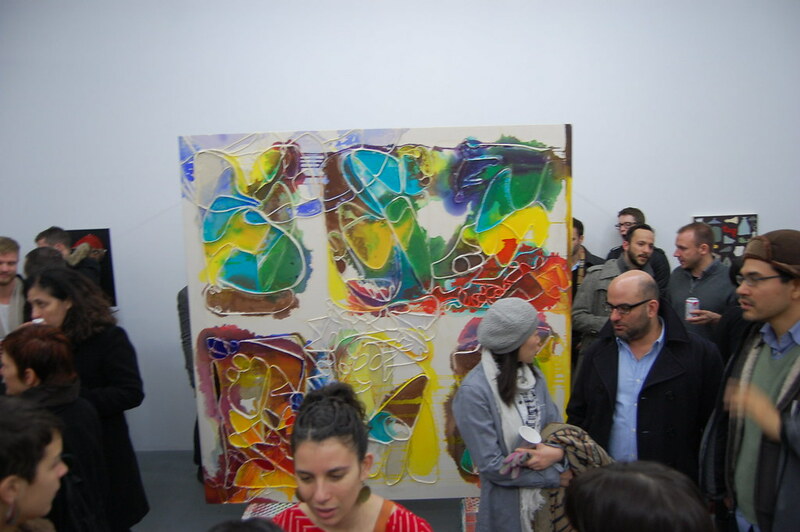 She has stained one side with masses and splatters of color and built up abstract figures around the canvas, which provides a thick, fibrous, and — yes — richly textured counterpoint to the stained "paint puddles and pools," as Jennifer Coates handily describes them in an accompanying essay. Detail of Dona Nelson, Spacey Characters, 2010. Acrylic mediums on canvas, 90 x 120 in. 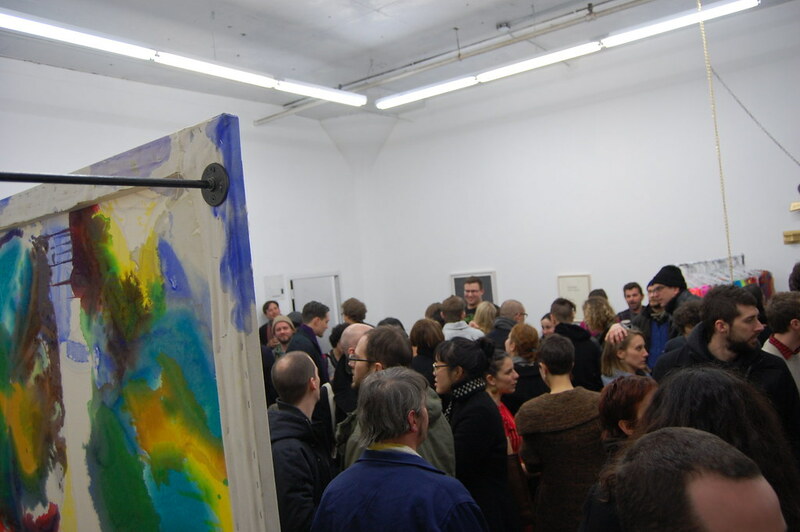 In October 2006, artist Carrie Moyer wrote in the Brooklyn Rail, "Nelson has converted the last 50 years of painting history into her own private mosh pit," an idea that I'm not sure I can improve on. The discrete stains may say Morris Louis, but the winding flows of string and the wild and effervescent splotches of paint on the painting's back explode any fixed notion of genre. Nelson mines the past, as Moyer says, not so much to craft pastiches as to develop new visual weapons. Note the way the work is hung (you won't miss it). It has been propped gingerly on two plastic crates and then secured forcefully to the wall by two metal poles and screws, as if someone (quite understandably) feared the work could vanish from this world just as magically as it seems to have arrived. At the very least, would-be burglars will have some work to do. Thank goodness. 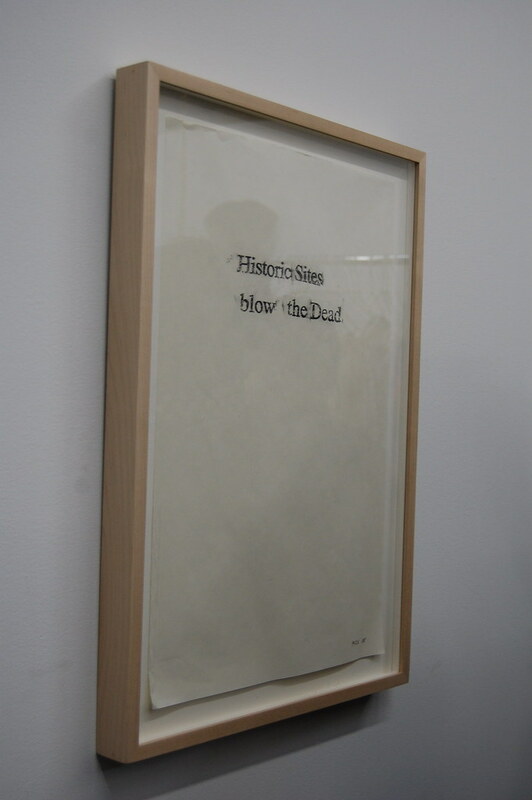 Mary Reid Kelley, Historic Sites blow the Dead, 2008. Crayon on paper, 12 x 18 in. 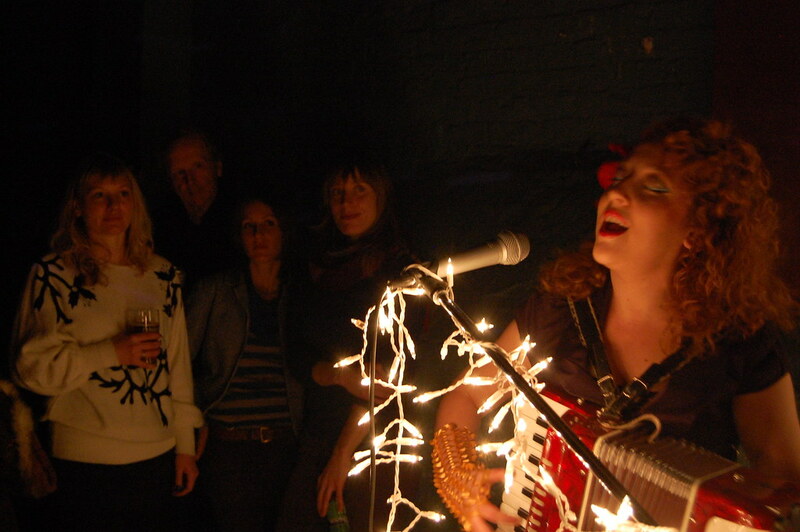 Kristen Kee, Beta, 2010. Soda, glass, rubber, canvas, digital print, 25 x 14 x 10 in. David Humphrey, Clown Party, 2010. 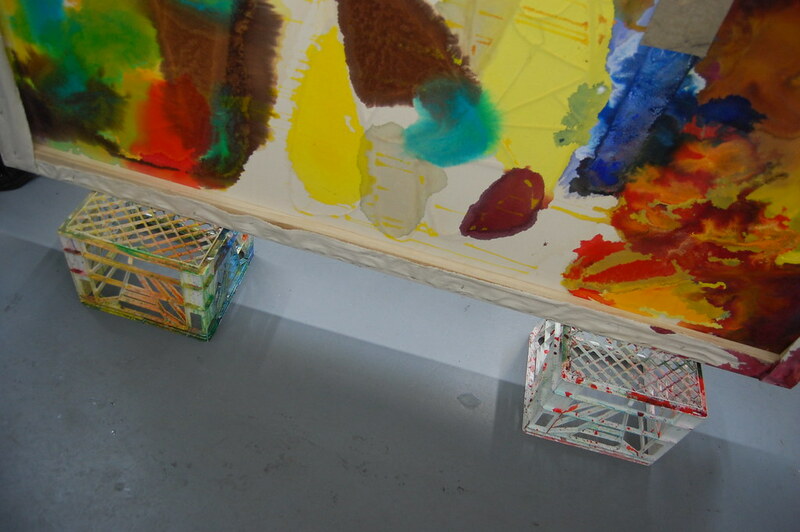 Paint, wood, and paper. There are two sculptures here, David Humphrey's Clown Party (2010) and Kristen Kee's Beta, that look especially strong and refreshingly new. 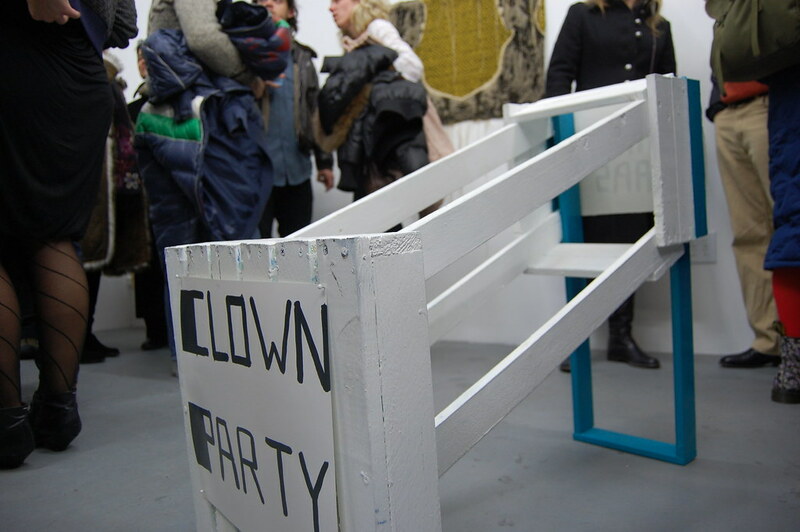 The former is a sloping box built from planks of wood and painted white and blue, its ends adorned with texts that read, alternately, "CLOWN PARTY" and "DOG BEHIND BARS." 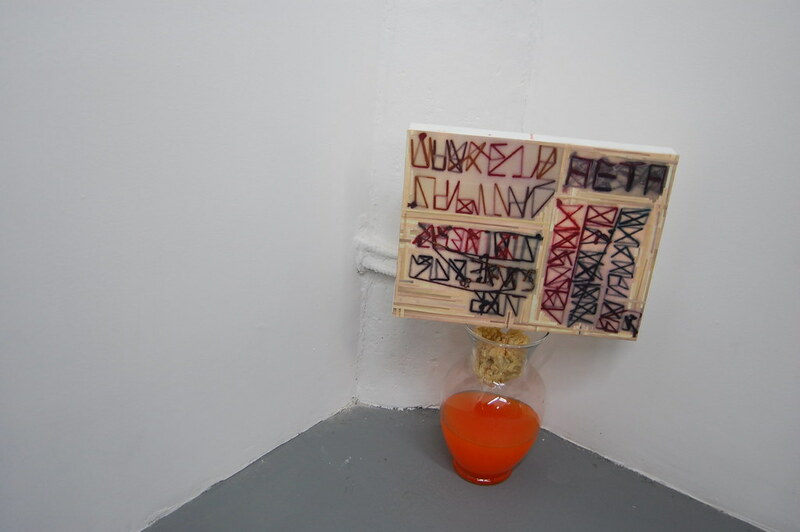 Kee's work is a glass vase filled with orange soda — a medium and texture we could all stand to see some more of inside art galleries — that supports a wooden panel covered with letters from some ersatz language. 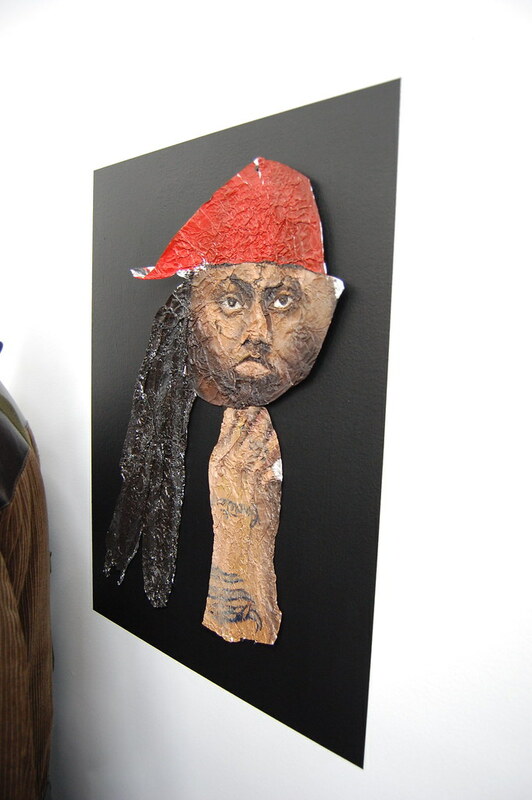 Not far away, Lucy Kim's oil-on-aluminum-foil portrait of Lil' Wayne, his head balancing on his upturned fist, looks out into the room and ever so slightly to the sky. He looks pensive and strong, and I think he would like it. Leeza Meksin, My Rack, 2011. 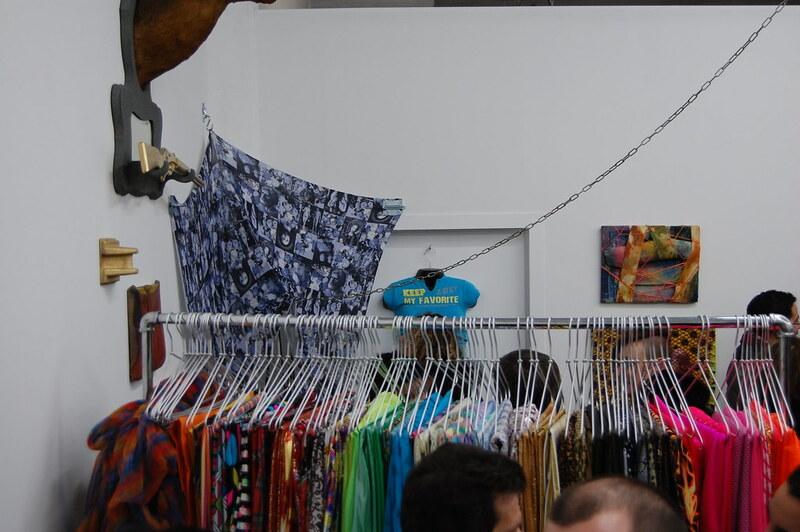 Spandex, racks, chain, spray paint, sand, sewing machine, found objects, site-specific installation. Lucy Kim, Lil Wayne - Flat, 2009. Oil paint on aluminum foil, 15 x 21 in. 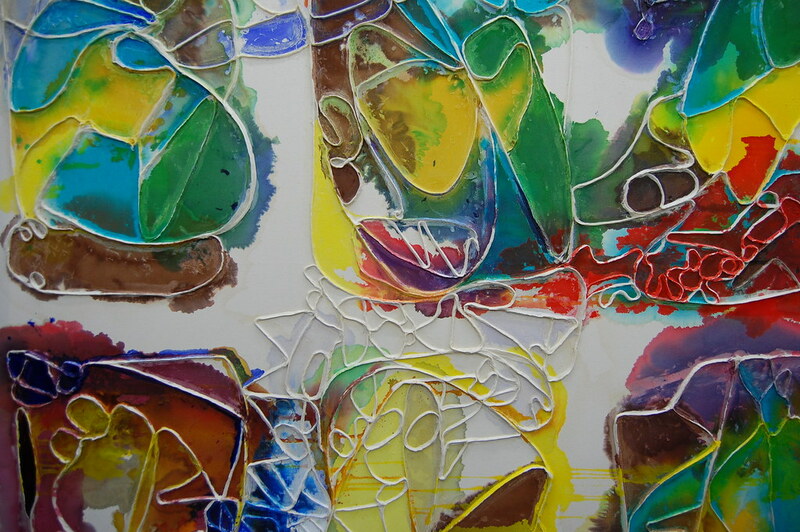 Partial view of Leeza Meksin, 5 Paintings, 2010-2011. Oil, acrylic and dye, on spandex stretched over canvas on wood. 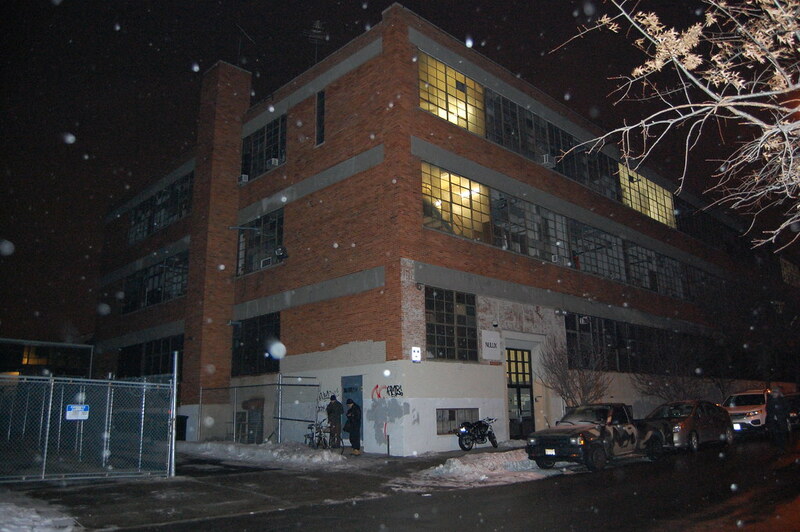 As the crowd was cajoled out shortly after 9 pm, many trekked south on Troutman Street, crossing Cypress Avenue, from Queens to Brooklyn. 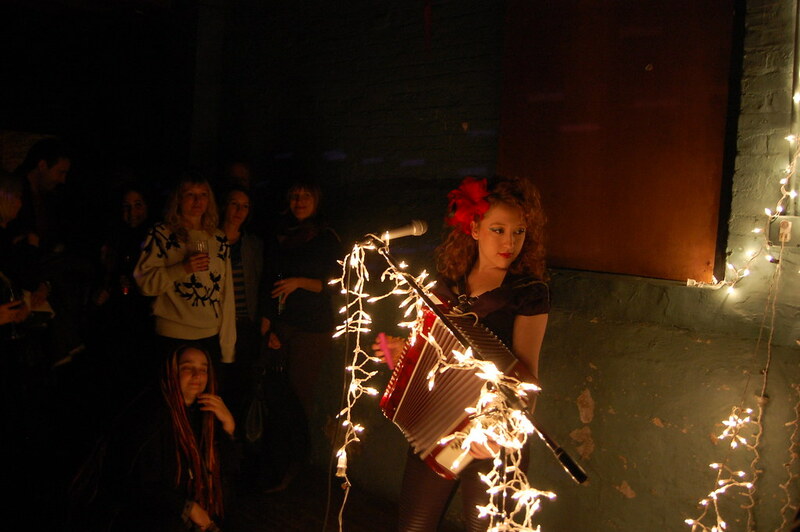 A few blocks down, the admixture of people flowed into an already-packed Tandem, where the impressively multilingual Mira Stroika played accordion and kazoo, regaling a large crowd in the back room as fresh snow began sticking to the ground outside.